I like narrow trousers. I’m pretty sure this isn’t a fashion thing – they are trendy and have been for a good year or two, but I think it has influenced my choice in tailoring for longer than that. I like narrow trousers because they suit, to my eye, my other clothing choices – slim shoes and tailored jackets. Having a rather large number of shoes I would like to display, it also helps having slimmer trousers that will rest on to of the shoe and not envelop it. However, I have a problem: perhaps due to several years of cycling, I have larger than average thighs and bottom. So trousers that are too narrow or too low-waisted get as far as my thighs and stop. This is particularly a problem with contemporary jeans, though less so with formal trousers. For jeans, I end up going for more traditional cuts – Levi’s 501s are pretty good, as are the Kilgour range of jeans, which are purposefully cut higher and use a clean, dark indigo in order to be smarter. As a result of this, it is always worth me keeping in mind how narrow I like trousers to be, in precise measurements, when trying trousers on. Without a ready comparison, it can be surprisingly hard to try on a new pair of trousers and get an idea of how narrow they are compared to your optimum width. You can, of course, compare them to the trousers you were wearing that day, but if these are very different in style or material they won’t help much. It also helps to get an assistant to pin the trousers at the length you would have them hemmed to – width can vary surprisingly along the trouser leg, and it is easier to see the width when the ends are not crumpled up on top of your shoe. All of which is a long way of saying that I now make a point of knowing the widths I prefer, in inches. I recommend doing something similar. Suit trousers – 16 inches. (Anything less than this I would class as very narrow). Jeans or more casual trousers – 17 inches. I’d be interested to hear other people’s preferences. You can follow the discussion on Know your trouser width by entering your email address in the box below. You will then receive an email every time a new comment is added. These will also contain a link to a page where you can stop the alerts, and remove all of your related data from the site. Someone else with the same cycling ‘chicken legs’ problem. I have a great pair of Zegna jeans and to wear them I more or less had to stop cycling. Are there particular brands more friendly to those who like to cycle to keep fit? what kind of pants are pictured? Brett – I think you basically have to go for the higher-waisted ranges that will go up and over the power thighs. Most jeans brands that make many different lines – Levi’s, Gap – will do some more high-waisted ones. For more fashion jeans, you probably need to look at the more traditional labels, such as Kilgour, than at the Italian, younger lines. I have a similar problem with the fit of pants from years of gymnastics then cycling. I find that Boss wool dress pants fit well. For jeans, I have gone with Lucky brand (some sort of straight leg, relaxed fit) for my last two pairs, and find that they fit well. Genes give me the “rugby thighs” that are the envy of many guys. I actually have to avoid working them out so as not to not have them balloon further. In recent years the narrow leg look has driven most of my regular trouser/jean makers to re-cut existing garments so that I can’t get them much past the knee. At 45 I still have a 33-34″ waist but now seem to require a 42″ to get leg-room when I was buying a 34″ as recently as 2 years ago. I’m not willing to make my arse look like a loose sack of potatoes for the sake of designers who think I can change my body shape to suit fashion. It’s nearly the reverse of what I found 20 years ago when I bought business suits. I had very similar measurements to the models featured, but all the actual garments were made for “middle-aged portly” and had to be ruthlessly re-tailored. I wish I was a bit more on the fit side. I am tall and thin, and have been wearing slim narrow leg trousers, let it be formal, chinos, or jeans. Maybe you would like to try the following. Buy your selves a pair of comfy, but not baggy trousers and have them takenin from knee down. Say somethign like 7 inches, or 7.25 max. the trick is to get as long as the edge of your shoe, so that you sock is just visible, but there is not a folding of the trousers at the end. It’s fun, makes everyone look more athletic and slim, regardless of the trousers’ material. Hence you can display your shoes, and keep comfy around the waist. But remember not a baggy pair, jus a comfy, preferably a bit lower waist. Do you still get your suit trouser with a 16 inch width? Thanks Simon. How do you find the slimness affects the drape / line of the trouser (particularly with pleats)? Hi Simon, on trouser length, what do you aim for in formal trousers? One break with the hem at the back just falling below the top of the shoe? More often than not, most men in suits I see have trousers that puddle around their shoes. However, it is a fine balance and in my opinion, better too long than too short (although short, skinny trousers seem to be fashionable for some inexplicable reason). On an unrelated question, I have a very nice grey/navy mix flannel odd jacket. It is very similar in tone to my mid-grey flannel trousers. What would you suggest (and I appreciate this is hard without seeing it) as appropriate trousers? Indigo jeans work well so I was thinking charcoal flannels and cream or some sort – chinos? Charcoal and cream sound good on the last point. On length, yes a break at the back and hitting the heel of the shoe (not floating, no matter what height it is at on the shoe). A break at the back and hitting the heel? Really? Thanks, an old post this and I think that’s a mistake. I’m agreeing with the reader: one break (at the front) and touching the heel at the back. Though that’s longer at the back than I’d have today. I was a little startled yesterday to discover I did not own a trouser—of any kind—that was wider than 15.5″. I’ve been on the hunt for Incotex in my town, and so far everywhere I’ve gone, the shops only seem to stock the Slim and Extra Slim fits. I was at one of these shops yesterday, and although I didn’t take a tape measure with me, I’m certain the results were about the same. I’d love to know what the average measurement is on the Regular fit ones. Fantastic post. 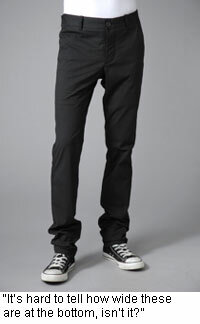 When your ar upto to your early forties, close fit trousers do well – give the neat agile look. But when older and when you start getting the few streaks of silver and your voice has mellowed a bit speaking slower but more authoritatively you need trousers that gently drape around your body shape without looking tight or close fit and the leg lines fall straight with only one gentle break about six inches to eight inches from the bottom of the shoe sole on the front crease and the rear bottom to cover just half of the shoe heel. Turn ups in this type look very decent and gentlemanly – a trouser looks complete with them. Well these are my own thoughts – I don’t know how good they’ll be taken. Thank you Paul. I certainly understand your views. Personally, I don’t think trousers should be too close in fit when you are 30 or 50, and there’s no reason the same style of trouser can’t be worn by someone older – by me in my 30s or my father in his 60s. The biggest restriction is just any change in body type and shape. I think that’s because I’d largely advocate your approach for a younger man, rather than suggesting the tight look could apply to an older one.